Hi guys! Just a quick hello today because I’m on vacation and I’ve got a tropical drink to sip and a stack of books to read. In honor of my island trip and Pi Day! I went ahead and made you the coconuttiest coconut cream pie I could imagine. I started with Seattle’s famous Dahlia Bakery Triple Coconut Cream Pie, and added some more coconut because – why not? This coconut cream pie is famous for a reason - it is rich and indulgent, and packed with coconut flavor. You can make the pastry cream and crust up to a day in advance if you are the type that likes to plan ahead. Just before serving garnish the pie with generous swoops of whipped cream and lots of toasted coconut chips and white chocolate shavings. To make the pastry cream, combine the milk, coconut milk, and coconut in a medium saucepan. Scrape the seeds from the vanilla bean and add the seeds and pod pot. Warm the mixture over medium-high heat and stir occasionally until the mixture begins to bubble around the edges. In a bowl, whisk the eggs, sugar, flour, and salt until well combined. Temper the by pouring a small amount of the scalded milk into the egg mixture while whisking constantly. Then add the warmed egg mixture to the saucepan of milk and coconut. Whisk over medium-high heat until the pastry cream thickens and begins to bubble. Keep whisking until the mixture is very thick 2-3 minutes more. Remove the saucepan from the heat. Add the butter and whisk until smooth. Remove and discard the vanilla pod. Transfer the pastry cream to a bowl and place it over a bowl of ice water. Stir occasionally until it is cool. Place a piece of plastic wrap directly on the surface of the pastry cream to prevent a crust from forming and refrigerate until completely cold. The pastry cream will thicken as it cools. When the pastry cream is cold, fill the prebaked pie shell with it, smoothing the surface. Whip the heavy cream and coconut cream with the sugar and vanilla until soft peaks form. 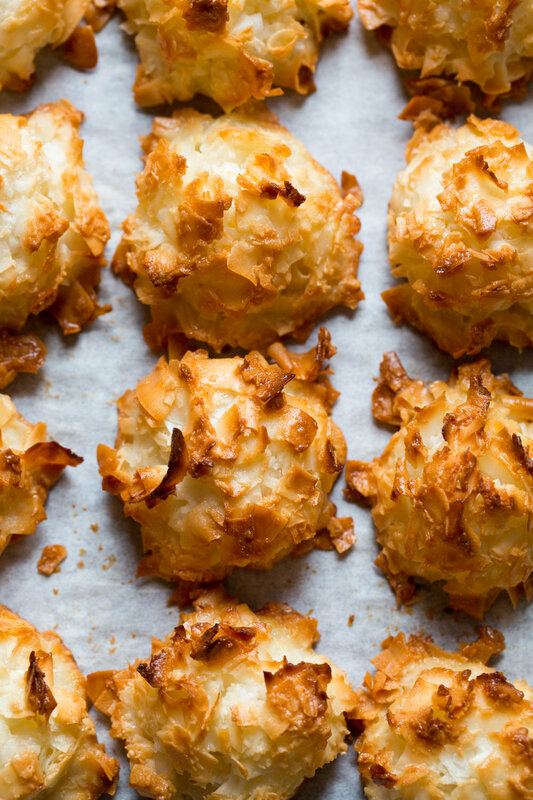 Spoon or pipe the cream over the chilled pastry cream and garnish with toasted coconut chips and white chocolate curls.